Events include many venues: demonstrating in schools, exhibiting in art festivals, participating in conferences and workshops. Preparing for a show seems to take more time than actually being there. Most of what I carry with me are props. My fiber inventory can fit into two armsized bundles, but the rest is everything needed to hold them up. When I started, waaay back in the late ’70s, my first show was in St. Augustine. This was during the “craft explosion” when artists began exhibiting in the streets, not having to wait to get curated into a gallery. It was a colorful, lively, free-for-all and the movement spread across the country. At that first show, I had no booth. I spread out a tarp and laid everything on the ground. One of the judges came by and said, “well, you have some nice work, but you gotta get a booth.” Thinking back, it was nice of him to comment. Many judges today are here and gone without notice, signifying their visit only by a tiny colored dot on your sign. But that li’l exchange started me on my way. In 1980, two of my “mainstays” gave me a base to build my craft, my display, and learn the business of taking my art on the road. 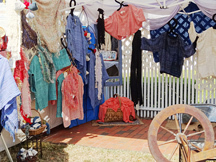 The Florida Folklife Festival (White Springs) and the Great Gulf Coast Arts Festival (Pensacola) are good examples of how the nature of the show grew with the wide variety of artisans that populated them. Throughout the ’80’s, this “colorful, lively free-for-all” that was an art show reflected alot of styles, handmade booths with colorful tops, and paintings and craftwork spilling out into the aisles. There was no uniformity, and many shows reflected a particular theme. One was the large Renaissance Festival held at the Ringling Museum grounds in Sarasota. At that show booths were expected to be of either “rustic” or maybe “rococo” design. The rustic ones, like mine, were often built from wood, bamboo poles, or maybe haybales. And at that show were outrageous costumes, sumptuous foods, energetic games, colorful banners on every post, and lots of animals. I took my dog, who parked himself in the aisle in front of my booth, stopping all the ladies who ooh’d and ahh’d over him, then came in to see my weavings. My paper-mache manikin, “Minerva”, was dressed in flowing wraps and scarves. I remember a parade of costumed “gentry”, walking their hounds, knights on horseback throwing spears or playing chess, and maybe a few geese and sheep for some of the demos. I included my spinning wheel and could spin up lots of yarn during that show. 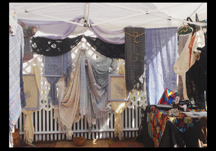 My handmade booth was a wooden one I shaped like a hexagon with an arched top. The arch was made of two crossing arcs cut from plywood, which attached to 6 sidewalls & held the whole thing up. It was a chore to set up (let alone carry on top of the car), and when the wind blew, with all my weavings fluttering from the sides- BoHo style, the whole thing creaked like an old boat. I liked that; it added sound to all the visuals. This show had much to attract festival goers and they formed long lines at the front gates, then paraded by, or through, the gigantic banyan trees, or pulled up in their boats at the back docks. All the museum/theater/circus/ and mansion buildings were open. Open for grand times, and grand art! 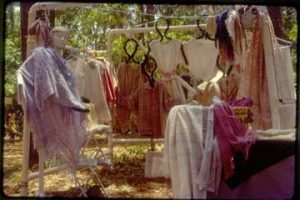 Back in the day, back before state parks dis-allowed open fires, my first heritage demos at the folk festival involved making dyes. 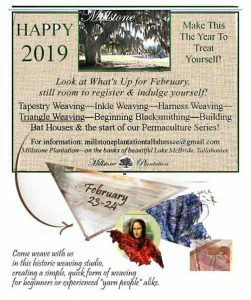 I’d start a fire, string a clothesline between trees, gather lots of pots, natural dye plants, and buckets of water and spend the entire weekend dyeing skeins of yarns. They made a colorful display hanging from the trees and below the branches, I rested in my hammock. People were full of curiosity, questions, and some wanted to help. 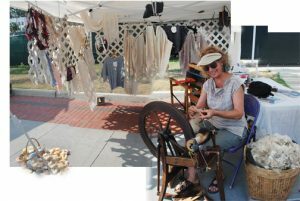 I’d also set up the spinning wheel, and with non-stop music from the nearby stage, I spun my wool, using my “instrument” to jam with the musicians. Visitors not only signed my guest book, but drew pictures across the pages, wrote me notes, or said “hi” to previous names they recognized. To add to this lively space, costumed story-tellers, wandering minstrels and jugglers, and hawkers of watermelon or ice cream would come share their own anecdotes. Those were fun shows! Nowadays, shows are much more regulated and more focused, from large events with national producers to local shows by a small town art club. Northern shows may involve a different preparation than southern shows. But booths began to reflect more uniformity and eventually, the “norm” of a white tent changed to an obligation. The “booth shot” for a jury must reflect a compatible look for their event. Street shows and parks offer varied settings and may entail an interesting ground surface (bricks or moss? ), or backdrop (fencing? pillars? ), or a nice tree to frame the shot. 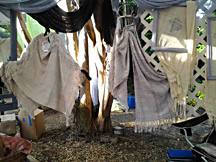 I once had a sprawly crepe myrtle tree within my booth space, which served as a good prop for some shawls. But generally, there’s no more spilling into the aisles, no more spreading from your 10 ft. space into your neighbor’s space, and definitely no fires. But before I got my tent, I built another booth. This one was white pvc. When I leaned on it, it still creaked like an old boat. Even with a more refined and defined display, there’s much more to setting up than “ready, set, go”. Some artists may have their work laid out in pre-set displays with backdrops of only a poster and some curtains. Others – the ones with heavy art works or large paintings, must set up strong metal frames and high canopies. Some, like me, have a myriad of small parts that seem to fall into a different place at every show- adding confusion, time, and thoughts of “how-did-THAT-get-HERE!” The demos involve more equipment and supplies and the van is packed to the roof. Sometimes, parking near the booth site is not possible and every piece must be dollied, possibly over rough ground or even mud (once – through ankle-deep water). Setting up the whole thing usually takes me three hours. I stayed with those first two shows, the GGAF and the Folklife festival for 33 years, since both allowed me to continue to demonstrate. I’m still with the GGAF, (at this writing, 38 years) and still hauling all the props, equipment, fleeces, mannequin or stands, banners, easels, signs, baskets, floor mats, canopy braces, tent and booth weights … it’s been an interesting ride. When kids come to visit we can do a variety of things. Small weavings on cardboard? Large weavings on wooden frames? Maybe some paper-making, or vegie-dyeing on the fire. The sheep always demand their fair share of the day – another opportunity to eat! Mimosa or grain, they’ll take it all. 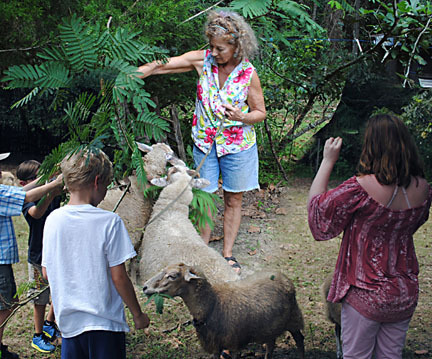 Kids get to personally interact with them, something they might never have done. Soft wool feels good, soft mouths tickle their hands. Last Sunday, visitors arrived ready to play. 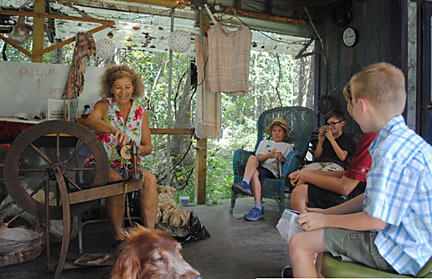 We visited the pasture, then settled on the deck to see the weaving/spinning demos. 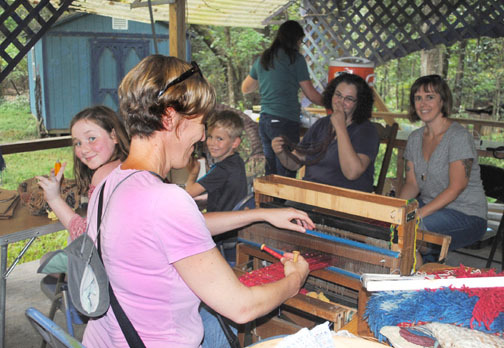 Afterwards, everyone grabbed for their yarns and cardboard looms and jumped into the world of fiberarts. They were working on scout badges and so got to explore various fibers, textures, colors, and whatever they intended their final project to be. These projects are meant to be finished at home, so I hope that I will get to see them later. Meanwhile, check out the photos on FB. 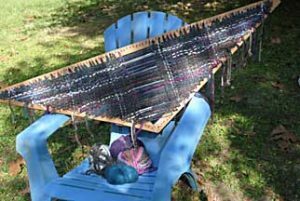 “Dyed ‘N Wool” fiber activities for kids. The Renaissance Festival is going on this weekend in Cascades Park. This included medieval craft demos, medieval foods, a fountain “fest” for the kids, lots of people in costume, and the full play of Romeo & Juliet. 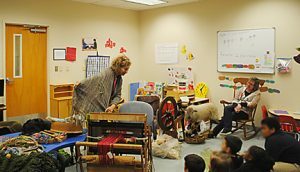 I was demonstrating on Saturday, always a chance to introduce the loom and spinning wheel to the kids.